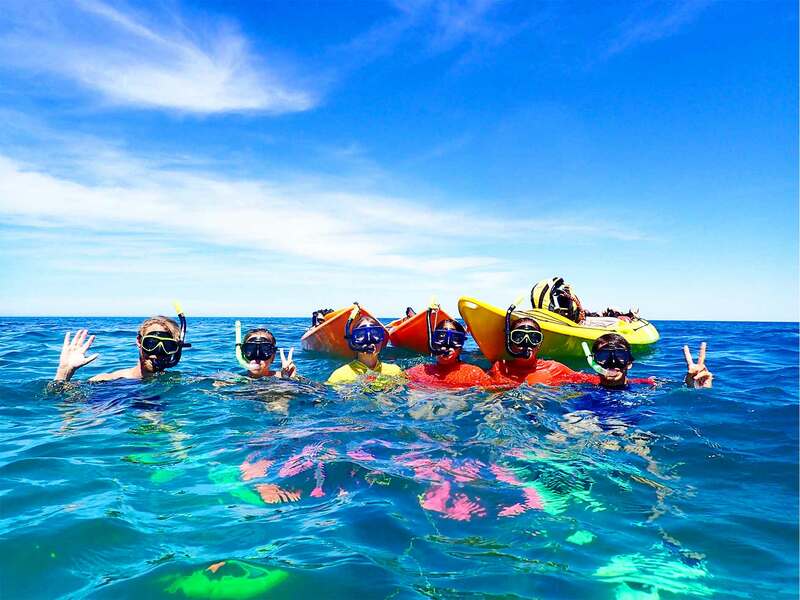 Join us for a half day sea kayak and snorkel adventure in the wildlife-rich Bundegi Sanctuary Zone, in amazing Exmouth Gulf, amongst the northern stretches of World Heritage listed Ningaloo Reef. Spot turtles in the shallows from your kayak; rays, baby reef sharks and birds including osprey are also commonly seen. Take the opportunity to snorkel from your kayak amongst the sheltered coral gardens and enjoy the colourful fish life. Tour start time changes daily depending on the tide. Some days may not be available due to unsuitable tides. Please check our booking form for daily tour times. Tour departures are subject to weather conditions and minimum numbers. Is this tour not available on the date that you would like? Check out our Weekly Tour Calendar to view other tours that may be available. A great introduction to kayaking and a unique, family-friendly way to explore the amazing waters of Ningaloo. Spot turtles, rays, schools of fish and more from your double sit-on-top sea kayak in the sheltered, shallow waters. Yes, this is our recommended tour for families to enjoy together. The minimum age we take on the kayaks is 8 years old, there is no maximum age! I am a solo traveller and would like to book this tour. Do you take single bookings? Yes we do! Solo travellers are most welcome on our tours. Please note that on most tours we use double kayaks, so you may end up paddling with another participant, or the guide. We will run the tour with a minimum of 3 people, and usually have no more than 8 people. Yes, non-swimmers are welcome. All of our guests wear PFDs (life jackets) whilst kayaking, and you are welcome to wear them whilst snorkelling if needed. I've never been sea kayaking before, can I book this tour? Yes, this tour is suitable for novice to advanced sea kayakers. Our guides will give you the skills and information you need to safely enjoy the tour, and be on the water with you at all times. Do I need to be super fit to enjoy this tour? No, an average level of fitness, and a sense of adventure are all you need to have a blast. The tour does involve snorkelling from the kayaks (don't worry, getting back in is easier than you think - we'll show you how). The kayaks have a weight limit of 110kg per person.